"Well, they came home and delivered the bacon...The new Lloyd Webber musical, with lyrics by rock legend Jim Steinman, tells a great story in a whole new way. The first thing to report is an intensely strong evening of music theater, with gospel, rock, blues...and fantastic operatic rock duets bound brilliantly together in a superband uplifting evening of faith, hope and cha-cha-charity...With Steinman, lyrical genius behind the best of Meat Loaf and Bonnie Tyler, Lord Andrew has tapped into a new narrative opportunity of epic anguish. Gale Edwards...has fought fiercely, and inspirationally, for the center of this work. And her designer, Peter J. Davison, has provided a hydraulic, half-complete motorway that both implies impossible escape and a division between the over-ground adults and the secret, soul-shattering encounters below. These are enacted by Lottie Mayor...and Marcus Lovett...with as much passion and skill as you can find on the London stage. They are fantastic, suggesting sexual possibility forbidden and fulfilled in Lloyd Webber's climactic (with David Cullen) orchestrations. Their lips just miss, but their vocal cords are spot on. As always with Lloyd Webber there is this tension between ecclesiastical music and rock. He lets loose with Steinman in a wonderful snakes and drums number for the alternative witch hunt. But mostly you roll around with pleasure at his echoes of Panis Angelicus, the gorgeously structured, tenor-driven passage on the Nature Of The Beast, and an astounding item called A Kiss Is A Terrible Thing To Waste, involving Swallow, Man and James Dean look-alike Amos (Dean Collinson). 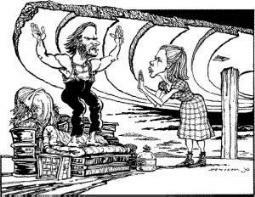 Amos and Candy (Veronica Hart) suggest a motorbike world elsewhere and are ingeniously included in the plot. They have a great Steinman-style number, Tire Tracks And Broken Hearts. John Turner as the avenging sheriff and James Graeme as Dad show up well. The kids are terrific..."
"Well worth a place in the West End or, for that matter, Broadway. In fact my principal complaint is that I can't stop the title song from whistling and winding its preposterously pretty way around my eardrums...This rural outback contrives to be both God-forsaken...and God-Obsessed. Indeed, the evening opens with a roaring, soaring chorus, The Vaults Of Heaven, in a grim, gray Baptist chapel with the words "Jesus Lives" in forlorn neon outside its windows...But the main emphasis is still childish innocence versus adult anger, disappointment and paranoia as represented by both Jesus's hunters and Jesus himself... [The Man] makes a Christ-like sacrifice at the end, a genuinely moving one. Classify him with the half-masked phantom of the Paris opera and the cracked goddess of the Sunset Boulevard as one of the more memorable of Lloyd Webber's damaged monsters." "I found myself both moved and beguiled, damn it. Lloyd Webber has at last come up with a hit for those who don't quite get the point of him." "One of the most heartfelt and touching shows Lloyd Webber has written. It is blessed with an outstanding, instantly memorable score that ranges from rock 'n'roll to wistful ballads and emotive gospel...The show does have real charm. I found it impossible to resist a chorus of kids singing a ridiculously catchy number called When Children Rule The World...There are also dramatic moments of real power in Gale Edward's production and an impressive, split-level set by Peter J. Davison...Marcus Lovett plays the killer-Christ figure with tortured intensity and a wonderfully strong voice and Lottie Mayor...sings beautifully and is genuinely affecting in her grief for her dead mother. The real stars though are the wonderfully varied and occasionally electrifying songs..."
"This conversion of Mary Hayley Bell's original novel into a musical is undeniably a triumph...Whistle's real achievement lies in its narrative drive and superb stagecraft. With designer Peter J. Davison, director Gale Edwards has worked wonders on the Aldwych stage, raising and lowering levels and creating the nearest thing to cinemascope we're ever likely to see on a live stage. The tug of war, too, between Lottie Mayor's virgin Swallow, on the cusp of sexual awakening, Dean Collinson's James Dean bike-boy and her adoration for Marcus Lovett's un-redeemable convict provides spine-tingling musical drama. Maybe it's the addition of Steinman, but the injection of a new collaborator seems to have had a galvanizing effect on Lloyd Webber. Maybe only he could have set neo-Verdi arias, rock 'n' roll, and Kurt Weill side by side and managed to bring it all off. Amazing." "Not since Phantom Of The Opera has Lloyd Webber had a really big, new hit. Could Whistle be the miracle he needs? Could be, could be....There hasn't been such a showcase for West End prodigies since the curtain fell on "Oliver" and the young stars rise to the challenge jubilantly...The most stirring kid-free scenes are between The Man and the girl-woman Swallow who wants desperately to believe he is the messiah who will bring her dead mother back to life. What starts as innocent is infused with a sexual electricity in the second act which The Man struggles touchingly to resist. The two combined, with intermittent help from George Michael look-alike Amos, sure can belt out a tormented love song. 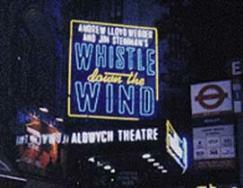 Whistle Down The Wind is a good, solid musical. It has plenty of old Lloyd Webber echoes...but also manages to cover new ground." "Whistle Down The Wind" is a musical which has everything - good tunes, a strong story with a real sense of drama, and a strong family appeal. The characterizations are exceptionally strong for a musical...[they have] created a mature, thoroughly professional piece of work, and something of an object lesson for those who aspire to write musicals...a triumph!" "This is a dark, thoughtful, intelligent show about religious obsession...it's debts are...to Elmer Gantry and John Steinback and The Grapes Of Wrath...it is a genuine development of the original, with a yearning intensity and a lyrical, intense, reflective score which I believe will be recalled when many more immediately acceptable scores have disappeared forever. Above all, it remains a play with songs, and the play has a power of plot and character development which most of us had long since given up looking for...This is far and away the most ambitious show Lloyd Webber has ever attempted...When the Wind listens to its own whistle, and stays true to its own dark soul, it is deeply and dramatically moving..."
"The score is a winner with several memorable songs including the instantly-hummable title song. Vaults Of Heaven could replace You'll Never Walk Alone on the football terraces. When Children Rule The World will feature in every kiddie show. No Matter What sung by very appealing children closes the first half...There's always something exciting to look at and spectacular surprises too." "The result is, literally and figuratively, a thousand miles from the film and novel...a succession of stylized musical set pieces [turn] a subtly woven parable [into] a visual and aural spectacle to rank with Webber's finest shows. This up- scale adaptation spares nothing to wow the audience...pastiche is given full rein as the music segues from romping blues to thumping rock 'n' roll to intimate ballad. Sudden shifts of pace are par for the course with Lloyd Webber and give Whistle remarkable pace and energy." "My goodness what a show! The theatrical snobs who currently think it is fashionable to anticipate - maybe even hope for - the demise of Andrew Lloyd Webber as Mr. Musical can dismiss it as froth to their hearts' content. But those who are not discouraged by smug reviews will find a show which confirms him as the genius of his field...The two-tier set is the best I have ever seen; the evocative changing colors of the sky always catching the mood; and the use of steam and reflection achieving a remarkable sense of horizon, depth and perspective. The songs are strong as ever, brilliantly delivered by fine voices...Among the most memorable are the title tune, The Vaults Of Heaven, Unsettled Scores, A Kiss Is A Terrible Thing To Waste, If Only and Nature Of The Beast. It's a great show...You'll love it." "A cracking good book, an excellent lead in Marcus Lovett and some sensational kids...Lloyd Webber and...Jim Steinman have given us some ace toons crackingly directed by Gale Edwards. Bored? You couldn't possibly be...The audience adored it and the cast got a huge ovation." "I was looking forward to giving this latest Lloyd Webber show both barrels...No such luck...it comes over as charming, unaffected and a great story to boot...It has been said that Lloyd Webber changes lyricists more often than most men change their underpants. But his teaming up with Jim Steinman - the brains behind Meat Loaf - has proved a masterstroke. The eccentric lyrics are met with some Fifties rock and roll, honky tonk and electric road songs leaving room for Lloyd Webber to slip in some delicate harmonies in the love scenes. The thrill is in the mix." "Whistle Down the Wind is more emotionally accessible and musically alive than anything Lloyd Webber has done in a long while...But Lloyd Webber's most inspired choice is his new lyricist, Jim Steinman, the veteran rock composer (Bat Out Of Hell; Total Eclipse Of The Heart), whose fevered, hyperbolic lyrics have unlocked Lloyd Webber's long-dormant rock tendencies...The Steinmanesque angst in songs like A Kiss Is A Terrible Thing To Waste, or the yearning, over-the-top lyrics like "If all that died again would grow/These are the loneliest words I know," have inspired fresh passion and urgency (and a good beat) in Lloyd Webber's music. Forget that falling chandelier; Steinman has brought Lloyd Webber back to the land of the living."